Here is a recording I made recently of the International Space Station talking with a group of school kids in Alabama. This was recorded as the space staion passed over my home in the Cincinnati area. I hope that you enjoy the astronaut talking with the school children. Their questions are quite good. I am unable to receive the "uplink" signal because it is tightly focused to the spacestation. I also had petitioned NASA to have a local school (Little Miami) included in a future passover. In addition to hearing several of these "school" conversations, I have receive slow scan television pictures from the ISS as well as one brief contact with the station as it passed over the Cincinnati area.. (Have also seen the spacestaion visually). 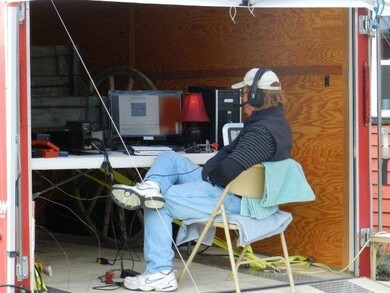 The small hut I have contains, all the modern radios in addition to a collection of radios from the 50/60s.I usually talk thru "amateur" satellites (10-12) and have several thousand contacts. In addition, the complex currently contains an 11" telescope for clear nights and looking at the wonders of space. 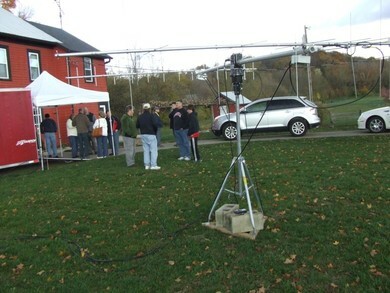 At a "star party" in the fall of 2012, there was a demonstration of radio-satellite communications. This consisted of tracking and talking thru small "basketball" sized satellites in LEO low earth orbit to radio operators within the "footprint" of the fast moving satellite. A typical pass lasts about 11 minutes with the satellite traveling in excess of 20,000 miles per hour. Highly directional antennas with pre-amplifiers allowed for the .1 watt signals to be clearly heard. 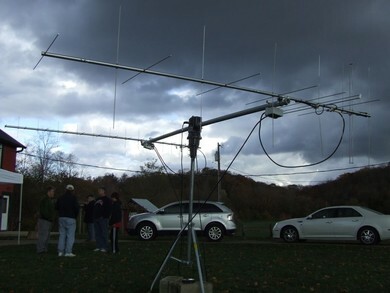 A computer (with the orbit information) allows for the antennas to track the satellite and it also adjusts for doppler shift in the frequencies. A computer map shows the ascent and descent of the satellite and the footprint area being covered. A highly accurate clock is the final piece to make this all happen as it should. At the "star party" over 24 contacts were made across the US and also one with Puerto Rico. 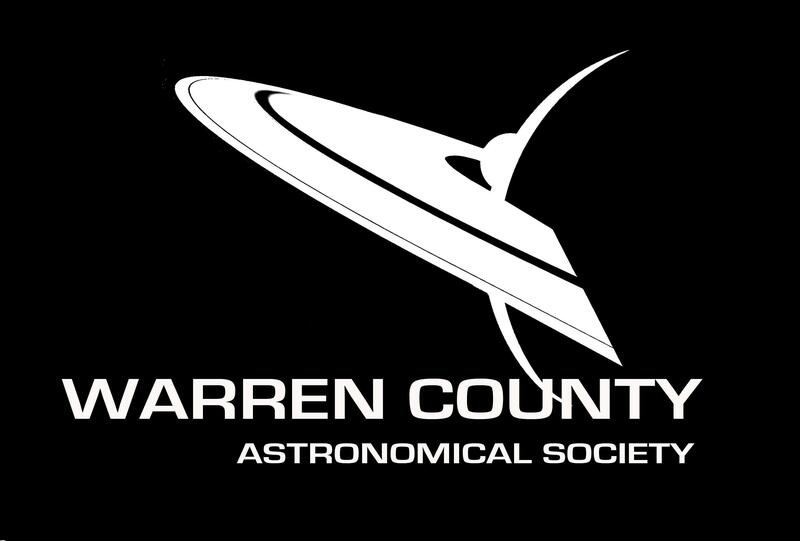 I was surprised to find the number of astronomers who either had been a ham radio operator or are and amateur radio operator. Future efforts will include trying to do EME (Earth-Moon-Earth) this is bouncing signals off the moon and back to earth after a 3 second journey and possibly listening to the radio emissions from Jupiter. In 1978 shortly after I joined Hewlett Packard I attended a small group presentation by Barney Oliver then the head of HP Labs. His presentation was on how we could apprach trying to contact others in the universe. "Meeting at the watering hole" was the title of his presentation and it has stuck with me over the many years. Barney was the first director of the SETI project. Unfortuniately we lost Barney in 1995 but his inspiration and spirit lives on. The attached article explpains the title. A number of the new earth satellies (amateur) will operate at 1.2 Ghz..
“Where shall we meet our neighbours? At the water hole, where species have always gathered” – Dr Bernard Oliver, former head of NASA’s SETI programme. For oxygen breathing, water-drinking carbon-based life forms such as ourselves, space is a barren desert, with vast stretches of unbearable nothingness between the oases of life that we are searching for. As it is for us, so it must also be for any extraterrestrial intelligence out there. Unless they have developed the means of superluminal travel and can hop across the light years with free abandon, they too must quail at the immensity of space that acts as a possibly insurmountable barrier to us ever physically meeting. There is, however, an alternative, a place we can come together and communicate with one another. Rather fittingly, this cosmic oasis is known as the water hole. An all sky survey of neutral hydrogen in the Milky Way. Image: J Dickey (UMn)/F Lockman (NRAO)/Sky View. It’s a band of radio frequencies sandwiched between emission from neutral hydrogen – 1,420 MHz (a wavelength of 21cm) – and emission from molecules of hydroxyl (1,666MHz, 18cm wavelength), which is composed of one atom of hydrogen, and one atom of oxygen. Combine hydroxyl and neutral hydrogen, and you’ve got a water molecule, H20. The 21cm line, the most famous in astronomy, is produced by a quantum peculiarity in the nature of the electrons within the hydrogen atom. Particles have a property called spin, and every now and then the spin axes of the electron and the proton within a neutral hydrogen atom will switch from a parallel configuration to an anti-parallel one (to grasp what anti-parallel means, an analogy is to think of two bar magnets, lined up side by side, but with their north and south poles pointing in different directions to one another). When the switch takes place – which for a single hydrogen atom is a very rare occurrence, but given all the countless neutral hydrogen atoms in the Galaxy the laws of probability suggest that it’s a surefire bet that there are plenty undergoing the switch at any one time – the electron moves to a lower energy state and a radio photon is emitted, with a frequency of 1,420MHz. 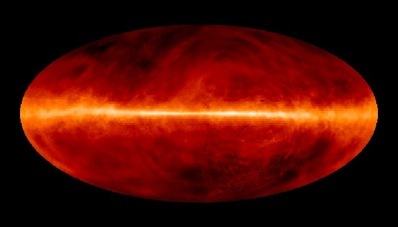 So what do astronomers do with this? The most common atom in the Universe is hydrogen, and the majority of visible matter in our Galaxy is interstellar hydrogen gas. Neutral hydrogen forms a doughnut-shaped disc that encapsulates the Milky Way’s spiral arms. It was first measured in 1950 by Edward Purcell and Harold Ewen at Harvard, six years after Dutch astronomer Hendrik van de Hulst predicted that it could be detected by radio instruments and could be used to trace the structure of the Galaxy. Measuring the Doppler shifts of the great interstellar clouds of hydrogen that line the Milky Way’s spiral arms allows astronomers to measure the rotation curve of the Galaxy and infer its mass, or do the same for any of the myriad other galaxies our telescopes can see. The microwave window is found between 1 and 10 GHz, with the water hole between 1,420MHz (hydrogen, H) and 1,666MHz (hydroxyl, OH). 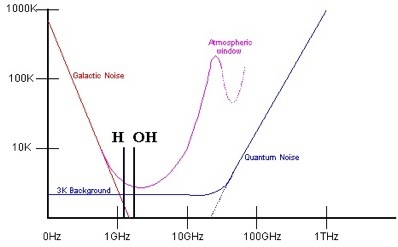 Sandwiched between the hydrogen and hydroxyl lines, the water hole band of radio frequencies are relatively quiet (hence, a radio ‘hole’), and anyone broadcasting on one of the frequencies would come through loud and clear. Given the importance of the hydrogen line in particular to astronomy, radio telescopes are scanning this area of the spectrum all the time, and could easily see a signal if they happen to be looking in the right direction at the right time. Indeed, this possibility was identified as early as 1959, by Giuseppe Cocconi and Philip Morrison in their seminal 1959 Nature paper. But things are moving on. “People have done the easy experiments, the simple things where they covered the ‘magic frequencies’, and radio SETI is trying to branch out and cover a much wider bandwidth,” says Dr Dan Werthimer, a SETI scientists at the University of California, Berkeley. That’s not to say we’ve given up on the water hole, but given fifty years of silence perhaps a little impatience is beginning to creep in as scientists look to try new things. Maybe ET isn’t tuned into the water hole at all – perhaps that entire idea is a little too parochial. So what else is there? Jean Heidmann, the late Chief Astronomer at Paris Observatory, suggested using multiples of the frequency of rotation of nearby pulsars. Along with the SETI Institute’s Dr Jill Tarter and François Biraud of France’s National Centre for Scientific Research, CNRS, Heidmann conducted a search of nearby stars for signals on such a frequency. The system worked as such: using the radio telescope at Nançay, France, they took the example of a local pulsar, PSR 1929+10, which has a rotational frequency of 4.414 hertz (in other words, the pulsar rotates on its axis 4.4 times per second). Multiplying this by two-pi, eleven times over, gives 2,659.98MHz,(2.66GHz) which falls within the microwave window. Amazingly enough, they actually detected a signal, but it was only seen one time and never repeated, thus breaking the cardinal rule of SETI that a signal has to be seen to repeat to be believed. There is a lot of guesswork involved, although multi-channel receivers capable of accumulating data from millions of channels at once, each channel merely a few hertz wide, certainly help. If magic frequencies can be identified by us, be they familiar like hydrogen or obscure like those incorporating the mathematical integer of a fundamental constant like pi, then surely advanced extraterrestrials can do the same? Possibly. Assuming they have organic chemistry such as our own (and why not, given that water and carbon are ubiquitous in the Universe, and are the simplest molecular devices for life?) then the symbolism of the water hole to any technological civilisation should not be lost on them. But whilst it is a great place to start looking, the water hole isn’t the be-all and end-all that it is made out to be – there are plenty of other frequencies out there that ET could use. It’s going to be a long search.